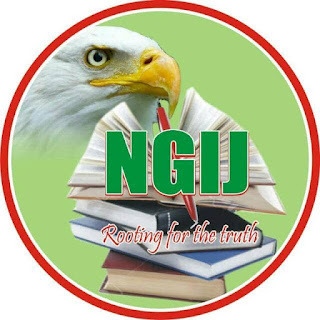 The Nigerian Guild of Investigative Journalists, NGIJ, has urged the Federal Government of Nigeria to end the recurrent extra judicial killings by security agencies most especially, the Nigerian Police. NGIJ, after a monthly strategic meeting held in Lagos recently appraises news of abuse of fire arms, abuse of powers, police brutality and unprofessional conduct being exhibited by men and officers of the Nigerian Police force against the good citizens of the country and therefore, called on President Mohammad Buhari led government, the judiciary and the police authority to ensure an end to social injustice in the country. Oki Samson, NGIJ Vice President, in his statement said; “ from the avoidable death of Ada Ifeanyi, Kolade Johnson, the unfortunate incident of actor Lanre Adediwura and singer Viktoh to the trending video of a police officer smashing N200,000 worth IPhone, the activities of the police over land crisis in Lagos and Ogun state that has attracted condemnations from the judiciary and civil society groups; these uncivilized and many other abuse of police powers demand immediate and aggressive response by government at all levels. Oki added that “today, the sight of a police officer send shiver down the spine of Nigerians instead of instilling confidence. NGIJ decries “the devious manner in which unscrupulous elements in the Nigerian Police are executing their statutory duty recently, stressing that it is incomprehensible that a young promising Nigerian was murdered in cold blood after watching a football match, a pregnant woman was battered, youths injured because they are donning necklaces, bus drivers are beaten for not parting with cash, bike riders are arrested unjustly amongst other flagrant abuse of human rights and attempts to extort innocent Nigerians: such are the litany of the heinous affairs of some elements in the Nigerian police”. Oki added that “NGIJ has set up a 10-man committee to monitor closely the prosecutions of the reported cases of extra-judicial killings by the security agencies. The Guild opined that, “it is high time to make the training and retraining of police officers a priority. The training should not be limited to the regular combative, force intelligence or other routine trainings. Emotional intelligence must be introduced into the training curriculum. Promotions shouldn’t be given to police officers without promotional trainings”. “Emotional intelligence as a globally accepted skill required for career progression and personal development in the 21st century is fast gaining traction in private institutions in the country, the public service especially the entire security architecture must embrace it. There is no cogent reason why the Nigerian Police should not adopt this all-important competency in its set-up.